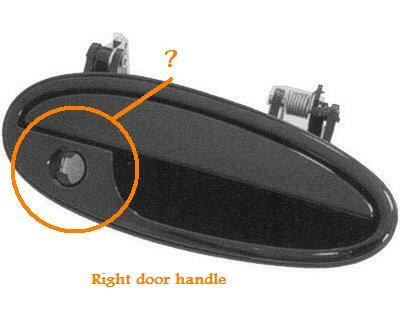 The door key will not open the door, the linkage appears to disconnected. I do not have a key fob. Any thoughts as to how I can entry into the car? What about the other door? Bet in their infinite wisdom GM and most don't put a key hole for a real key on any other door! Don't own this but there is a kit mostly used by motor clubs still AYOR that can spring the door open using an air bag type thing giving a chance at reaching a power lock button OR still AYOR "Slim Jim" to reach rod probably swinging in there with assorted tools. May need to call a locksmith if you can't get the other door open. That or break the glass. The locksmith would be cheaper. Can't say DS. I really notice stuff like that and was about to buy a new truck no less and had no key method for passenger's door - look at them now. Asked if I could order one new without power locks - stuff your key fobs, dead batteries or lost or parked in such that you can't get near another door. It was a Mustang I think older than this with no passenger's key spot at all. I really don't know if an option package or what can delete key access to even same named vehicles. What if sold to the "right hand drive market?" I got stuck with a LOT of cars mostly not trucks with assorted reasons keys were locked in car, trunks or second sets even out of state fixing torn up and broken stuff from wild groping with slip jim kits mostly. The air bag thing worked on the Mustang just torqued the door just enough to reach (forget if retrieving keys or hit button) that worked as keys were in sight in the car. Can be a real pest to damage. Owners: If you don't have a second set of keys or way to get in if only to move a dead car you are in trouble. This car, if key is possible on passenger's door think about getting a new one made with proof of ownership and its VIN you might just get the OE stuff at a dealer and pay royally for it? They probably already have that Sh!t. I forgot which year vette, you probably already know, but the remote had a little BB inside it that would complete circuit in the remote to cause it to transmit, so when your keys and remote were jiggling in your pants pocket as you walked up to the car, the door would unlock. When you got far enough from the vehicle were it couldn't detect the remote, it would lock the doors. Of course you still could use the key to unlock the doors.